Located on Ten Pound Island in Gloucester Harbor.. In 1817, Ten Pound Island became a local tourist attraction when several of the locals reported observing what they called a large sea serpent near the island. This included a Keeper at the lighthouse, Amos Story. In 1925, during prohibition, the Coast Guard would place amphibious vehicles by the island shore to catch rumrunners in the area. In 1940, just before Christmas, Keeper Ed Hopkins’ wife, who wanted to guide the dropping of presents (a tradition that still continues today at some lighthouses) from a helicopter by the Flying Santa “Edward Snow” to the lighthouse, nailed newspapers on the ground to spell out a huge “Merry Christmas”. Snow took a photo of the scene from the air, gave to local papers, which circulated to the Associated Press. The image was all over the regional newspapers the next day. The city of Gloucester is still one of the main commercial fishing ports in Massachusetts and offers plenty of deep-sea fishing and whale watching excursions, some of which may pass by the lighthouse, or you can enjoy some of its walking tours. To get close views, you can take the "Lighthouse Cruise" offered by Harbor Tours Inc. of Cape Ann, or hop on one of many of the whale watching cruises offered out of Gloucester. Check the variety of museums that the Cape Ann area has to offer. The Cape Ann Museum for instance, offers exhibits and events in art, history and culture of the Cape Ann area. The Rocky Neck Art Colony in East Gloucester is the oldest continuously operating art colony in America. The Beauport Museum is a beautiful 40-room mansion sitting on the rocks along Gloucester Harbor, visited by many of the famous, including Eleanor Roosevelt. 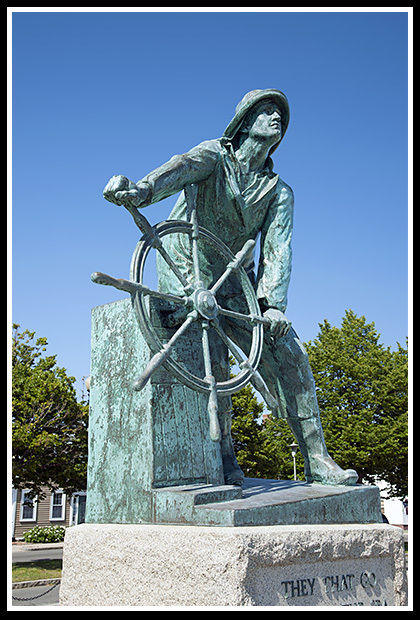 The Gloucester Fisherman’s Memorial Statue, also known as The Man At The Wheel, is a national icon that looks out over Gloucester Harbor as a memorial to those that lost their lives in this challenging industry. It is located on Route 127, on the south side of Stacy Blvd., where visitors can also see Ten Pound Island light from the shoreline. Just down the Stacy Esplanade is a newer memorial conceived by the Gloucester Fishermen's Wives Association, dedicated in 2001 to the long-suffering fisherman's family. This 8-foot statue, stands on a 20-ton boulder, and shows a fisherman's wife with her two children, looking out over the harbor. The lighthouse can be seen from many points along the Gloucester waterfront, with one of the best along Route 127 at Fort Square. Take Route 128 to Route 127A. Follow Route 127A to Commercial Street. Take left on Commercial Street and follow until your reach Fort Square. Take Route 128 north to Exit 10, Gloucester. Bear right onto Eastern Avenue and follow to a stop sign at Main Street. Bear right onto Main Street. Rose's Wharf is 1/4 mile on the left opposite a gas station and the Crow’s Nest Pub. Boat cruises and ferries mentioned below may offer many types of cruises. 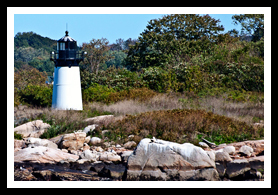 Some may pass by Ten Pound Island Light, and pass by Eastern Point Light leaving and entering Gloucester Harbor as part of specific lighthouse cruises, charters, narrated wildlife and historic tours, whale watching, fishing tours and other types of excursions. In addition to whaling and deep sea fishing excursions, offers narrative Lighthouse and Lobstering tour that includes Ten Pound Island Light and Eastern Point Light as part of their Outer Harbor Tour as a charter service for large groups. 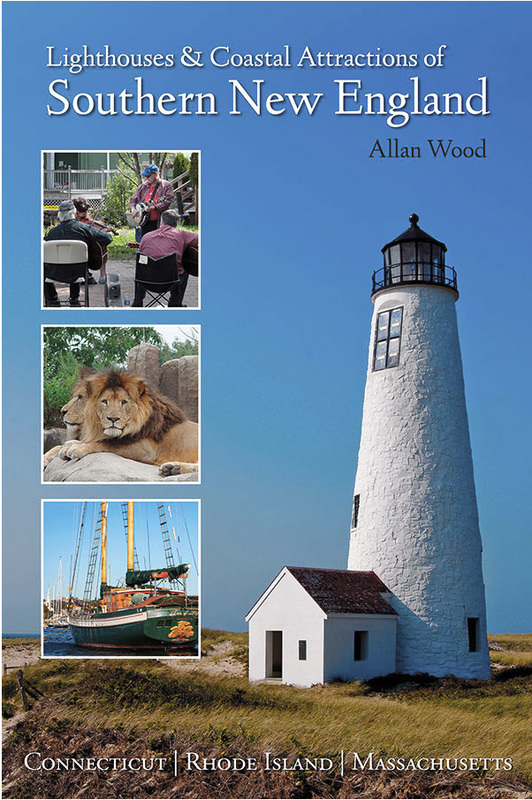 Offers a 2 1/2 hour narrated tour Cape Ann's scenic coastline to view six lighthouses.